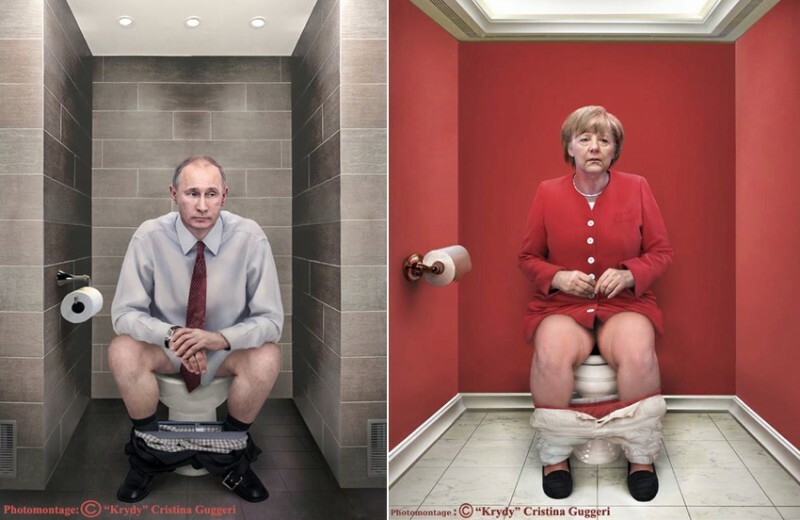 A humanising image series by Italian artist Cristina Guggeri depicting the powerful at stool. It’s called Il Dovere Quotidiano, (‘The Daily Duty’). 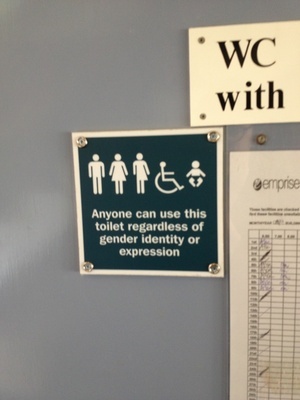 Posted in Photography and tagged leaders, toilet at 8:06 am on January 15, 2015 by Broadsheet. If the build-up to Sochi taught us anything it is that the Putin picture couldn’t possibly be accurate. Surely he should have two toilets in his cubicle? Obama’s totally owning that dump. What’s gas is that his turd missed the bowl and completely levelled a Pakistani madrassa. 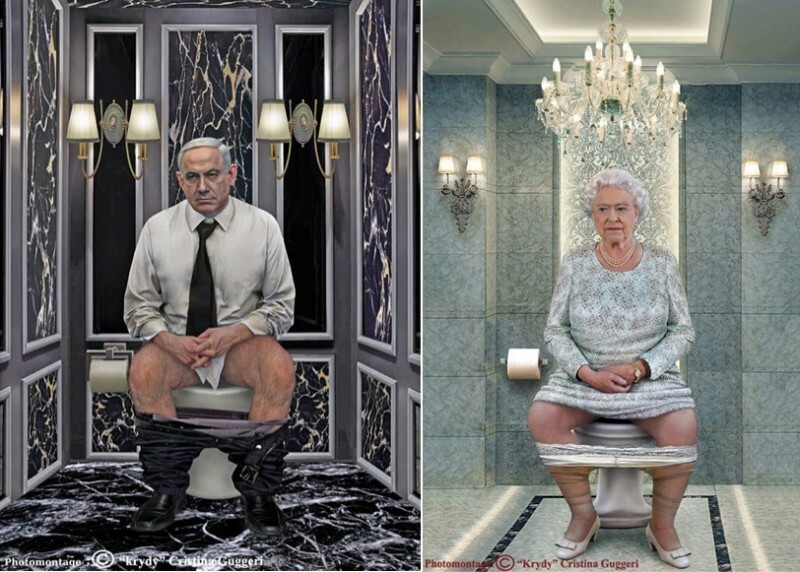 I really like these, it shows almost a weak humanity in these tyrants like they are contemplating the consequences of their decisions while dropping a deuce. They’re all going to bump their heads off the ceiling when they stand up. Why did that Guggeri lady depict them all in hobbit houses? 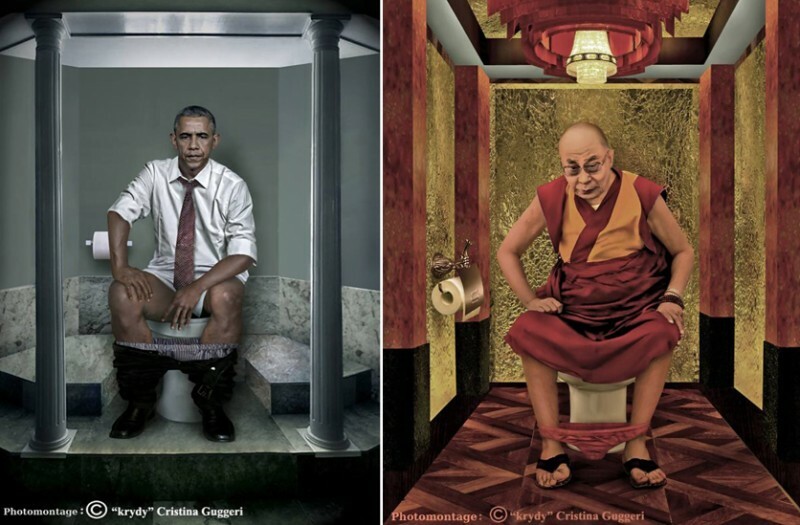 The Dalai Lama should start his day with a bowl of All-Bran and a few prunes by the looks of things. I think it is jose manuel barroso. had to google him to remind myself what he looked like. Might be. Also, Merkel would make a fine number 3 by the looks of those legs. In this context I know what a “number 1” and a “number 2” are, but how does one go about making a “number 3”? I should have said ‘Tight Head’ as that’s what i meant. God, that doesn’t make it any less of c double entendre does it. None of them on their phones? What, no Enda Kenny? Maybe that’s why he’s so full of (the other) BS. 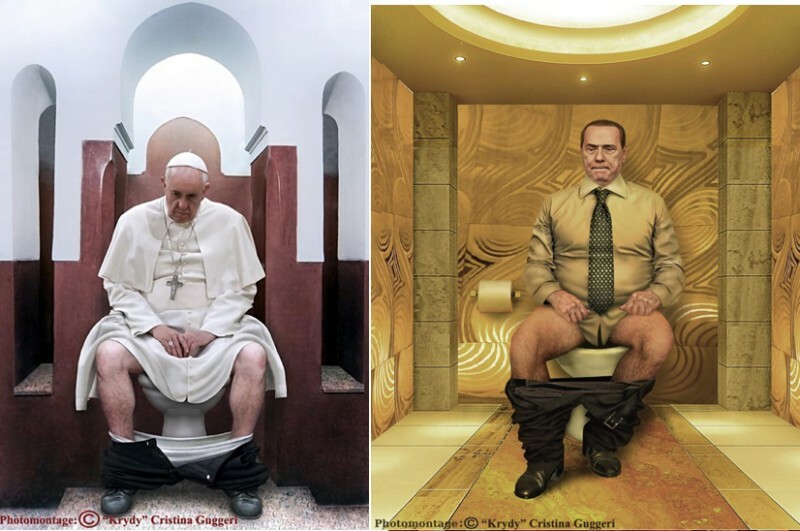 And is Pope Frankie so glum because he’s run out of loo roll? Feckin’ Elvis Impersonator, will this pope stop at nothing to court popularity! El Papa isn’t real, he doesn’t have red shoes on. 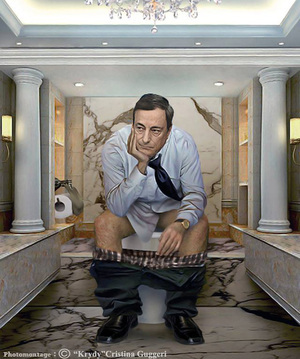 Looks like Berlusconi is going ” Commando” !!! I recall RTÉ issueing a grovelling apology, at the top of their Live at 6 news, to Brian Cowen after a totally news-worthy article the previous evening about yer man who painted a cartoon of him on the toilet and hung it in the National gallery. Freedom of expression his arse. Agreed. Not funny, not insightful and if done against an “ordinary” person would be viewed as a gross invasion of privacy and bullying in nature. I love satire but this is even more juvenile then Viz without the humour. you’re just ashamed at yourself over the dirty thoughts you had about merkel’s cankles, aren’t you?